Google has scooped up a start-up, one that unlike some other tech company pick-ups, you've probably heard of before. "The Bump team has demonstrated a strong ability to quickly build and develop products that users love, and we think they'll be a great fit at Google." The spokesperson wouldn't divulge future plans for Bump or how exactly it will fit into Google's current product and service offerings. Bump allows users to literally bump fists while holding their phones to transfer contact information, photos, audio and other files. 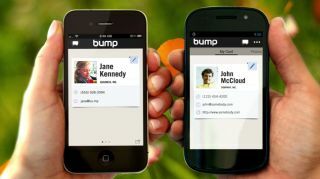 Bump also supports the transfer of info between a phone and computer. Bump was hugely popular when it debuted in the Apple App Store, and to date has garnered more than 100 million downloads there. Flock, meanwhile, offers to create a shared photo album between users and their nearby Facebook friends (say, while you're all at the same barbeque). Both apps have Android counterparts, naturally. Bump CEO and Co-Founder David Lieb wrote that Bump and Flock "will continue to work as they always have for now; stay tuned for updates." All signs from Google are that the apps will stay up and running for the time being, but that could easily change per Lieb's door-open "for now." While we don't know Google's plans for Bump just yet, TechCrunch put forward the theory that Flock holds the most interest for Google as it could help Google+ compete with Facebook and Dropbox's photo sharing and depository services. Google+ lags in engagement across the board, but creating a location-based photo sharing feature using Flock's tech could wrangle users away from the more dominate social network. What's more, Bump Technologies owns a nice stash of patents centered on device synching, and Google could stand to gain some nifty future developments thanks to this IP. Will Bump's technologies make it into Android 5.0? Check out the updates we're expecting.